Hey, hey, fall is here! Although it officially started on September 22, I can say that shorts and tank tops season is pretty much OVER. Fall temperatures in Barcelona have a moderate range. The average in October is about 18ºC / 64ºF, November being 13ºC / 55ºF, December 11ºC / 52ºF. This past weekend (October 15), I was in Sitges (about 40 km south of Barcelona), and it felt it was about 80º F under the sun. People were STILL bathing in the sea (although I’m sure the majority of them were sun-craving tourists). I was wearing a 3/4-sleeve gauze top and some cotton pants. And I was sweating! Having said that, it also rained a buttload last Wednesday. I’m talking thunder, lightning, the works. But it wasn’t very cold. Therefore, the entretiempo, as the say in Spanish (the seasons between winter and summer, aka spring and fall) has a range. As I mentioned in my What to Wear in Barcelona in the Winter post, this is how I came up with this ensemble, which I’ll repeat again. This is smart, urban style. Locals generally stick to “safe” colors: neutrals like brown, gray, black, and white. For fall, I played with a red palate…it was too much fun. Comfort and style. 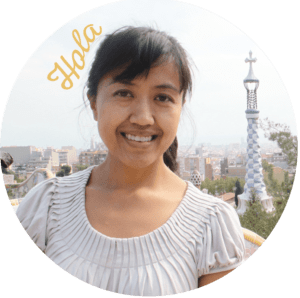 If you’re visiting, you’ll probably be walking tons, going to the underground metro, having a terrace breakfast at 9am, walking around the breezy port, then maybe having tapas downtown late at night. You wanna look good too, right? The Pocket Stylist by Kendall Farr is my fashion friend. Miss Farr emphasizes having durable pieces, or as she calls “indispensables” made of good material that will last through seasons. They’re pieces you can mix and match with trendier items. The ensemble is for about 10 days, assuming that you won’t be doing any laundry. Each top or bottom would be worn about 2 times. Drum roll please….THE COMPLETE ENSEMBLE! Two short-sleeved tops. If you go out for drinks in a crowded bar, or if you’re stuck in a stuffy cafe, you can still comfortably wear short sleeves indoors. I made sure they were kinda dressy so you can wear them for a nice evening out. Two 3/4-sleeved tops. You don’t need a knit jumper just yet. The materials can be light and breezy. One light sweater. This is good to have if you just want to throw a compact cover-up in your bag if it happens to be sunny that day. One light jacket. You may need it in the morning (around 9am) or after 8pm, when it starts to really cool down. One skirt. If you’re one to go out, I’d bring a dressy skirt to wear. Some thin tights might come in handy if the temps dip, but for now, I’d omit it. One scarf. This is a great accessory to have if you don’t want to bring a jacket, and you can layer it on top of your sweater if it cools down. It definitely adds a warm, coziness factor. This morning when I went out, I only saw a few women are wearing them. I love to wear a bright scarf to dress up my outfit! A robber-resistant purse. For the love of God, please don’t get robbed in Barcelona. A purse with a long strap that you can straddle diagonally across your body is perfect. And always have a zip on it. No snap buttons for easy access! Casual shoes. 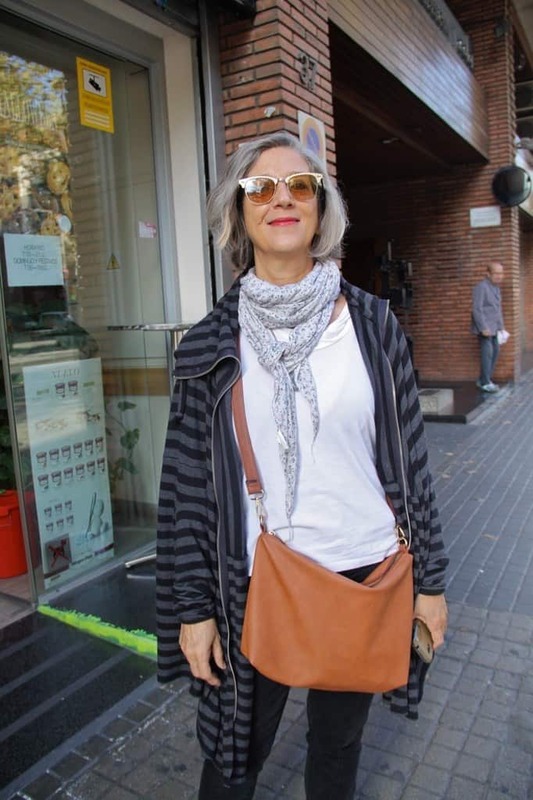 If you’re walking around Barcelona, you’ll wanna wear something really comfortable that you can wear from day to night. An umbrella (optional). You can always buy one as they’re super cheap. People will start hawking them for about 4 euros downtown if the rain really hits down hard. You won’t necessarily have to bring extra camisoles to go underneath it all. Going for 1-2 layers at the most is sufficient. A day at Parc Guell, maybe? Obvious Thing To Do #1: Check the weather forecast. Not-So-Obvious Thing To Do #2: Stay away from the extreme seasonal dressing. It’s not hot enough for cotton tank tops but not cold enough for a heavy, puffer jacket. Barcelona’s fall weather wavers between cool, rainy thunderstorms and warm (about 23 degrees). This fashionable local lady seems appropriately dressed for fall. Light scarf, light zip-up jacket, light cotton top, and some jeans. Plus funky glasses. Because Barcelona. If you want to blend in, Just say NO to short shorts in October. While they’re probably cozy, they’re not exactly a piece that makes you look local. But, hey, that’s your call. The Marge Simpson top is cute though. Again, these tourists are slightly dressed for summer here. 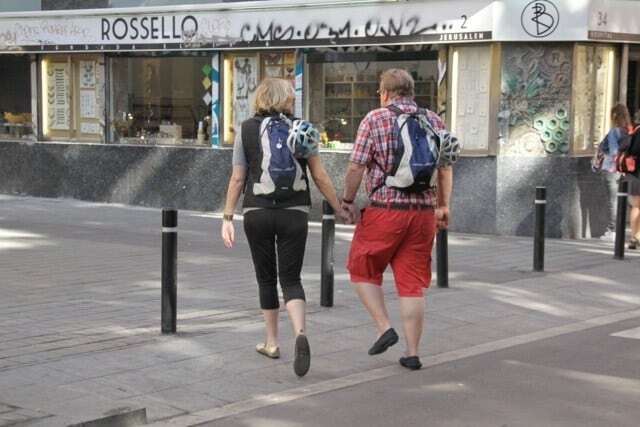 Perhaps it’s the combo of the backpack that give away the fact that they’re not from here? That’s it for this season! I hope you’ve found this post helpful. And enjoy Barcelona in the fall! 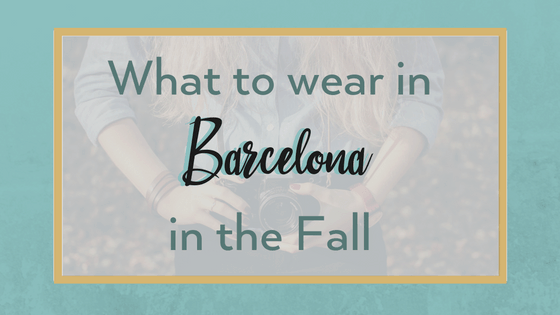 Have you been to Barcelona in the fall? What did you notice about how people dress?